Already popular in the consumer market, genetic disease risk screening is entering employee benefits. A number of employers, including Levi Strauss, Salesforce, and SAP, offer employees free genetic screening to assess hereditary risks for certain cancers and high cholesterol. While the consumer testing market may be driven by peace of mind, personal health, and/or general curiosity, employers approach the cost-benefit analysis from a completely different perspective. The first perspective, and not the focus of this blog post, is offering genetic testing benefits as part of a broader strategy to recruit and retain talent. For progressive companies, the addition of genetic testing may assist in ensuring an employer has the right talent for success. It would be another benefit alongside several uncommon benefits that help differentiate the employer, including student debt repayment, egg freezing, surrogacy assistance, and overnight breast milk shipping. If an employer is looking for more than just an attractive benefit, they need to be able to justify the cost. In other words, what does an employer stand to gain from genetic testing? This is the same concept as offering biometric screenings to employees, but unlike biometric screenings, which have been proven to be a unwise use of money, the jury is still out for genetic testing (or more so than for biometric screenings). A likely area to benefit is the belief that the results will help spur behavior changes that will improve employee health and save both the employer and employee money. The key thing to remember is that offering genetic testing to all employees at a large company is akin to screening the general public. This is where the math gets tricky for employers. Similar to annual physicals, not everyone should get genetic testing. Doctors are regularly suggesting genetic testing, but only for certain individuals like high-risk patients or those who have close family members with a certain disease. It is not a test that is being widely applied and rightfully so. For example, the U.S. Preventive Services Task Force (USPSTF), a federal advisory panel on evidenced-based preventive medicine, currently recommends against routine screening for certain harmful breast cancer mutations for women without cancer or a family history of cancer. It concluded that the net benefit of routine genetic testing for women could range from minimal to potentially harmful. Yes, harmful. While employers are looking for a path to financial return on investment, they may be increasing their “losses” by harming employees. Dr. Jonathan Berg, an associate professor at the University of North Carolina at Chapel Hill, summarized it best, “There is exactly no evidence that systematic screening of the general population for rare genetic conditions will have a net benefit in terms of health outcomes.” For large employers with diverse populations, the same will be true. That is, there is no reasons for employers to expect health outcomes to improve as a result of offering genetic testing as a benefit or part of an employee wellness program. There is exactly no evidence that systematic screening of the general population for rare genetic conditions will have a net benefit in terms of health outcomes. In regard to being potentially harmful, the genetic screening results may instill a false sense of confidence rather than prompt individuals to take certain actions to improve their health. It may also cause them to overreact. 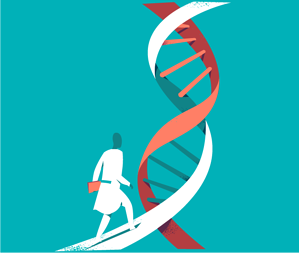 Since most cancers are not the result of hereditary mutations in single genes that can be detected by the tests employers are deploying, the results are inherently risky. For example, certain individuals may take their test results as a reason to forgo a USPSTF-recommended screening like a colonoscopy or undergo an unnecessary medical procedure like breast removal. Regardless of the perspective that is driving an employer to offer genetic testing, the uncertainty in value and potential risks of genetic testing is cause for reconsideration, especially given the popularity of the benefit (27% of Nvidia’s 6,000 employees in the U.S. took the free genetic test). The potential risks arguably outweigh the gains in recruitment and retention and certainly does not warrant attempts to use it as a tool to improve health outcomes. In both situations, employers offering free or subsidized genetic testing and promoting it to all employees without disclosing the risks, do not act as good stewards of their employees’ health.